A Nissan vehicle is a complex animal, and it should not be handled by just anybody. You need a team that has dedicated itself to learning everything there is to know about the Nissan brand and the amazing machines that it has produced. At Antelope Valley Nissan, we have just such a team. They will use their experience, knowledge, training, and tools to get the job done the right way the first time, and they will always find a way to get you back out on the road as soon as possible. If you look to the list above, you can see that we do a lot here, but know that the above list barely scratches the surface of what we are capable of. If you need any amount of maintenance or service done on your Nissan, then you can count on us to do it and do it right. We can even take care of your electrical system and that includes your stereo and infotainment system along with complicated engine and transmission components. 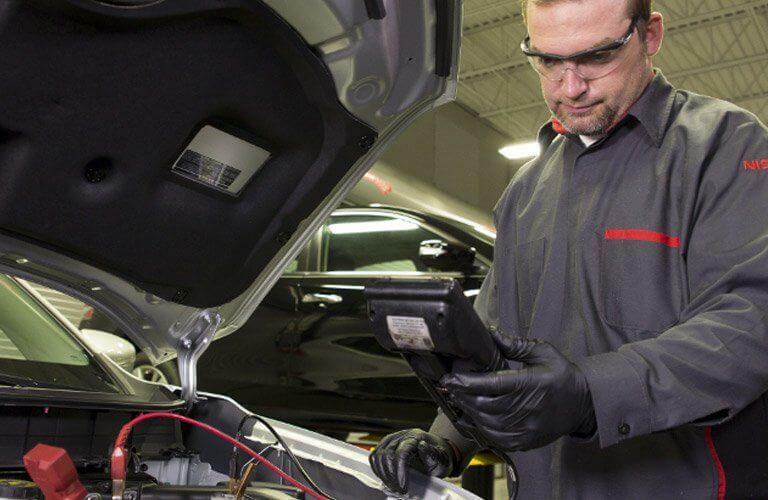 On top of all that, we also have an express service lane so you can get your Nissan taken care of right away without an appointment when you need basic maintenance performed. Our dealership and service center are both conveniently located in Palmdale. As you can expect given our name, this allows us to serve all of the Antelope Valley including Lancaster, Santa Clarita, and all the surrounding areas. If you have any questions about our dealership, our service center, or what our team is capable of, then feel free to stop by or give us a call. We would love to hear from you and we are always happy to help you with anything you may need.